At PAX East, we got another look at Citadel Studios’ indie MMO Legends of Aria, a sandbox with a completely player-driven economy that has been given a visual overhaul since last year’s PAX. I sat down with CEO Derek Brinkmann and had another go at their updated game. The first thing he said after mentioning the visual update is that the game has had its final beta phase character wipe, so that players are playing it for real now. He sounded pleased with player progress in terms of keeping the economy going, surmising that the richest players in-game were the ones who did nothing but buy and sell things. One thing to note, Legends of Aria has no auction house. Players can set up merchant stalls on their housing plots, and some forgo even building a home on the property in favor of simply making it entirely given over to inventory space. Buyers then have to physically go to those stalls or shops in-game to make their purchases. As before, inventory space is not managed with slots but are a more visual representation of how things are arrayed. In the merchant stalls we looked at, some players were more meticulous than others in their displays, and with no option to ‘snap’ items based on a grid, a precise layout of wares would take some time to achieve, just like organizing a store window display in real life. There are also NPC merchants that players can use to decorate their stalls. Those NPCs cannot be renamed, but they can be dressed like mannequins with various outfits. Many of the game mechanics remain the same as last year, with Brinkmann stressing most of their work over the past year was given over to polish and quality of life improvements. They’re still offering the same options for players to play on official servers or a limited number of privately-run servers with modified behavior from the base game. One of said private servers is being modified to have its own player-created dungeon, another has a PVP roleplay ruleset where players have to have a reason to go out and kill another player. Brinkmann stated that they want to have the base game further along before they open up the floodgates to allow more private servers. We then took a spin in-game with Brinkmann logging into an admin character, and he noted their intention to make two-factor authentication available to their general playerbase at some point, but it wasn’t ready yet. He further added that they went and revamped their dungeons because they were too small for the player base, so now they’re twice as big and the new second level of the dungeon is tougher and aimed at groups rather than the original first level that is more for solo players. They also changed the look of many of the dungeons to match the areas they were in. We stumbled across a player group in the second level of a dungeon with one guy running in there naked. While demonstrating some character abilities, Brinkmann nearly accidentally killed that guy due to an AoE bleed effect. The players twigged to the admin presence even though they couldn’t see the character in godmode, and there was a laugh. We then discussed their release plans. 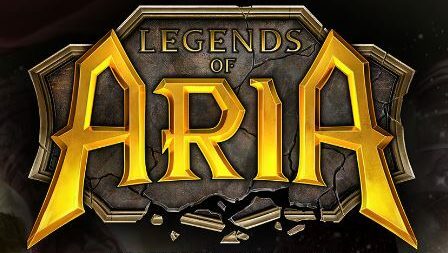 Legends of Aria is not currently on Steam, and they’re still considered in Early Access despite the final character wipe already completed. Brinkmann stressed that their crowdfunded players have a strong voice in game decisions, such as not to go to Steam until there’s more polish in the game because they want people to like it when it eventually gets released on Steam. He said they have no plans to put the game on the Epic game store because Epic requires exclusivity, and they’d already promoted their intentions of going to Steam. He also noted that other publishers would have their own ideas on monetization and game features, but they haven’t yet done a deal because they haven’t found a plan for monetization that their players would accept. Brinkmann further pointed out that eventually they will be adding items to their cash shop, but it would strictly be cosmetics. He said they were looking at adding a soulstone at some point which would allow a player to store skill points to use on an alt. One of the key features of the game is where players used to just drop a blueprint for a house and then it would instantly build itself. Now, a year later, the game drops a foundation and then requires the rest to be built over time, with players farming materials and then contributing to the build. The largest builds would require multiple players to contribute to it in order to complete. Another new mechanic is the creation of horse statues. Before, if a player rode their horse away from town and dismounted to get into a fight, they’d go back and find their horse dead. The statues allow players to dismiss their horses by saving them as statues until the fighting is over and then reclaim them afterwards and continue on their merry way. The game has come a long way since last year’s convention, and it’s obvious from the game’s polish and updates. We were playing in the live environment, not a carefully prepackaged demo, and one of the strongest points of this effort is the company’s devotion to their core fanbase, which are their crowdfund supporters. Brinkmann had earlier noted that they’d tested a cash shop item on their beta server, and the players roundly rejected it, so the studio removed the item before it went to the live servers. In this day when game studios are being frequently accused of not listening to their players, Citadel Studios is certainly showing a different way of doing things. Check them out at legendsofaria.com.